We've all wondered what it'd be like to chow down in outer space, but the closest we've ever gotten to the real deal is some melty Dippin' Dots. That's why we grabbed a man who actually knows this stuff, NASA astronaut Tom Marshburn, to break down how eating works in zero gravity. Marshburn has spent a lot of time in space, and even put in a five-month stint at the International Space Station (with noted Bowie impersonator Chris Hadfield), so he's scarfed down food and beverages that have been zapped into powders, blasted with radiation, or just sitting around for a year. He kindly took some time out of his Earth-bound lunch break to explain all the finer points of space dining. We called out the best parts, and threw in some additional info from NASA's official site below. While you can't really appreciate what meals are like unless you've been shot into the sky yourself, binging on Capri Sun is a good start. NASA has a whole staff of dietitians, engineers, and scientists who create astrofood at the Food Systems Engineering Facility in Houston. And one of their duties is taking every new food item on the NASA zero-gravity KC-135 airplane (aka "Vomit Comet") to see how it'll react in microgravity. If it passes this and several more tests, it's approved for flight. Also, here's a bunch of amateurs in the Vomit Comet, in case you were curious. 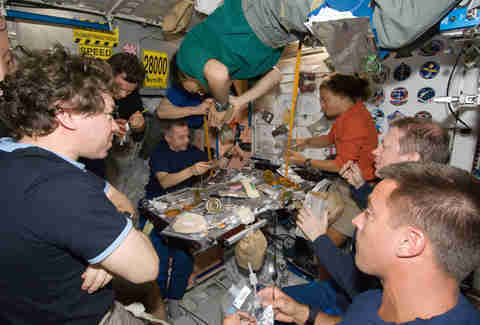 NASA makes sure its spacemen and ladies have all the food they need, but it also lets them pack their own stuff to break up the monotony of the menu, which operates on a cycle. "Whatever you want to bring has to be cleared by the food lab. No glass containers, nothing that’s really crummy, is allowed to go up," Marshburn says. "And I’m sure they have other restrictions I don’t know about. But we were allowed for a five-month stay about nine containers." Choose your snacks wisely. A number of entrees that go up with the crew are exposed to radiation (or irradiated) before the launch -- and unlike so many superhero origin stories, this is no accident. "The shelf life has to be very long. Years," Marshburn says. "What a lot of people don’t realize is that when they make something and send it up to us in space, it’s gotta be not just processed, but packaged, sent up from Houston to whatever place in the world the rocket is sitting waiting for it. That could be months. And then be processed with that vehicle and then wait to be put on board. And they have to have a backlog of food in case one of these vehicles crashes. So there’s food that’s been sitting there for a year before we even get into it." 4. And a lot more is "rehydratable"
You're probably more familiar with the "rehydratable" portion of the astronaut menu. That term applies to any item that's had the water removed to conserve weight. It could be anything from a mac & cheese to apple cider, but either way, you need to hook it up to the water dispenser onboard. The pouches containing the food have a "membrane" a lot like the ones you stab on your fruit punch Capri Sun, and once you've hooked it up to the needle on the dispenser, you need to choose your volume and temperature. Then the water shoots out and all of a sudden, that powdery mac is actually appetizing. 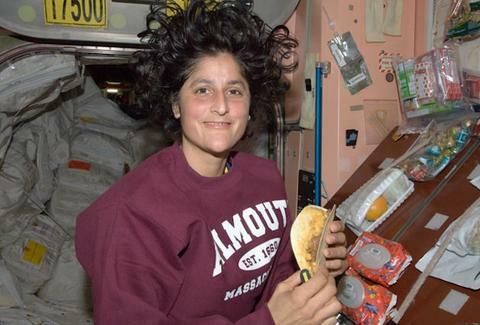 Astronauts discovered quickly that tortillas were a superior sandwich base -- they don't crumble, so there was no need to worry about breadcrumbs getting in the filters and they're nice and flat, so easy to store. But you'll never guess who supplied NASA with its first batch of long-lasting tortillas: Taco Bell. 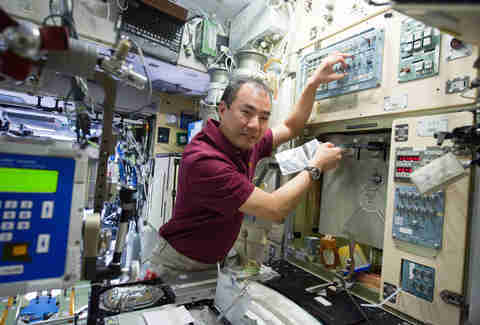 At the International Space Station, they actually have a warming oven, only it's not anything like the one in your kitchen. It looks a lot like an aluminum suitcase, but contains two plates with heating coils behind them. You put your food on the plate, close up the oven, and wait for your meal to cook. They didn't just stage these photos for the press -- astronauts are totally fine with letting their dinner wander across the room. As Marshburn explains, "What’s funny is you can tell the beginner space flier from the veteran when food starts to get away from them. The veteran just goes, 'That’s interesting' and they finish their bite and they’re all leisurely and calm about it and then they reach up with their spoon just before the food hits the wall and stick it on the spoon and eat it again." It only gets to be a problem when they return home, and have to do their damnedest not to drop dishes out of reflex. While commercial cereals are allowed in space, don't go thinking you can start your day with some Lucky Charms. Marshburn explains that, since you have to use powdered milk and water, only a few brands end up resembling what you see in your bowl on Earth. And apparently boring is better since one of the best contenders is Bran Flakes. 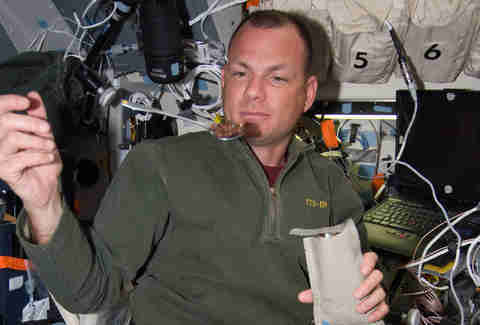 Astronauts aren't above an old-fashioned pantry raid, but they end up finding some odd leftovers. 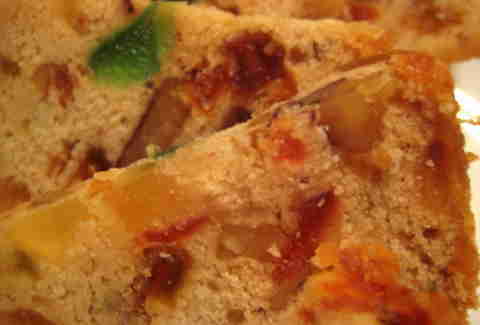 "We did find some food that people left behind, because they didn’t have time to eat it, and one of the best things was a fruitcake," Marshburn says. "Someone left a fruitcake about the size of a hubcap. We were shocked and surprised to find it, and that was a wonderful thing to have." While finding fruitcake isn't normally a joyous occasion, these guys clearly have lowered scavenger standards. "We did find a sausage that was way past its expiration date, but we didn’t tell anybody and ate it anyway and really enjoyed it," Marshburn says. "No one got sick!" NASA can't send traditional salt and pepper shakers with its crews because sprinkling of any kind is strictly verboten. (The salt and pepper would float away, and possibly get in people's eyes.) So instead, the team gets these bottles of liquid seasoning. The pepper is suspended in oil, while the salt is dissolved in water. Since they've got moon rocks to bag and aliens to sniff out, astronauts have to be in peak physical form. To make sure they're eating right, NASA has them weigh themselves on a "mass measuring device." It's basically a platform on a spring -- you curl yourself up into a ball, release the trigger, and then bounce on the spring. According to Marshburn, "the amplitude of the spring’s movement as it decreases and the time it takes to dampen out is proportional to your mass." You can watch it in action above. If only your bathroom scale was this much fun. Kristin Hunt is a staff writer for Thrillist, and would be okay with consuming all her beverages from Capri Sun pouches. Follow her at @kristin_hunt.